Recognized as the “Cradle of Civilization,” Egypt is the birthplace of the first lock and keys, comb and scissors, deodorant, makeup, and other household items that make modern life a notch or two more comfortable. A transcontinental country that crosses from the northeast corner of Africa all the way to the southwest corner of Asia, it is home to ancient structural marvels like the Luxor Temple, the Temple of Hatshepsut, the Pyramids of Giza, and more. But while its land area amounts to 390,000 sq. miles, 95% of it is desert and the majority of its population lives on only 5% of the country’s territory. However, even if 95% of Egypt’s territory isn’t suitable for setting up shop and taking residence, that hasn’t stopped the country from becoming one of the world’s diving hotspots. The Egyptian Red Sea is made up of three main areas – the Sinai Peninsula, the Northeastern Red Sea Coast and the Southeastern Red Sea Coast. Thanks to excellent water visibility, beautiful coral gardens, sheltered reefs, and a huge diversity of marine life, the Egyptian Red Sea is one of the world’s best scuba diving destinations. Located on the Southern tip of the Sinai Peninsula is Sharm El Sheikh. Situated between the Red Sea and Mount Sinai, it’s Sharm that earned the Red Sea its international fame – making it one of the best scuba diving destinations in the world. It wasn’t always accessible though; twenty years ago, divers had to be prepared to endure a long trek across the desert. And before they could enjoy the waters of Sharm El Sheikh, setting up camp at the beach was necessary as there were no hotels or lodging houses nearby. Fast forward to today however, 4 and 5-star hotels like the Ghazala, The Hilton, and the Mariott can be found everywhere. Linking the Na’ama Bay and Sharm El Maya, this dive site is just 5 minutes away from Sharm El Sheikh. Aside from easy access, the cliff is also popular for its coral reefs. A long, sandy bay that was first noticed during the early 1980’s, Na’ama Bay’s development is now complete – showcasing a seafront with a paved walkway lined with bougainvillea. But while it’s famous for cafés, shops, restaurants, and bars, its underwater delights are even more impressive. Just a few minutes away from Na’ama Bay are ‘The Gardens.’ The farthest and most seaward of the three ‘Gardens’ is a vibrant fringing reef that’s about 25 meters deep. Divers can easily find the glass fish caves, which are in the reef wall at 12 meters. The nearest garden, on the other hand, makes for an excellent night dive. Showcasing a sandy slope that’s 25 meters deep, divers are almost guaranteed an encounter with flashlight fishes, napoleons, and blue spotted stingrays. During daylight hours, you can find grey-reef sharks exploring the area. Known as Egypt’s first protected marine area, this national park offers several world-famous dive sites. During summer, divers and tourists flock to Shark and Yolanda reef to get close to the region’s sea life which includes jack-fishes, sharks, tunas, barracudas, and more. This island, which is sits at the entrance of Gulf of Aqaba, is home to at least 6 smaller dive sites. Thomas Reef, the smallest of the bunch, is famous for its coral-covered plunging walls, colorful fish life, and gorgonians. This offshore reef found in the northern region of the Red Sea is famous for its wreck diving sites. Moreover, these wreck sites are quite shallow, making it accessible even for inexperienced divers. Be warned, however, as the sea conditions and some very strong currents can be rough. Sent to the depths by German Bomber planes during World War II, the SS Thistlegorm has remained at the bottom of the sea for over 6 decades now. Located just 30 meters from the surface, vis at the wreck site is excellent and divers can see much of the original cargo such as trucks, motorbikes and even a train. For tourists looking to enjoy their holidays, Dahab is a unique ‘hippy’ town in the Red Sea Riviera. For scuba divers however, Dahab is home to world-famous dive sites like the Blue Hole and the Canyon. Scuba diving in Dahab has become synonymous with shore diving. Located 60 miles north of Sharm El Sheikh, many of Dahab’s dive sites and destinations can be easily reached by camel or jeep. From the narrow and continuous fringing reef that encloses Dahab’s shores, the underwater landscape quickly slopes down to the endless depths of the Gulf of Aqaba. Every dive site in Dahab has its own unique character – offering a lot of stuff for divers to discover and explore. Since many of the reef dives are mainly shore dives, entering the water usually involves nothing more than crossing over a reef-flat and going under water – making Dahab’s dive sites suitable for beginners and inexperienced scuba divers. This site is regarded by almost every diving professional as one of the most captivating dives in the Red Sea. Diving and exploring ‘The Canyon’ is almost guaranteed to put you up close to turtles, octopus, and other deep-water creatures. Considered a “Must Visit” for scuba divers, the Blue Hole offers something for every diver regardless of the skill level. New divers can enjoy swimming along its sheer drop off as they wait to see some of the exotic marine life that frequents the place. Experienced technical divers are advised to check out the arc – which connects the Blue Hole to the open sea. Just 7.5 km south of the Caves (about an hour trip from Dahab), Gabr el Bint can be found. With a depth of about 30 meters, this site offers two dives – one in its northern region and the other one on the south. What distinguishes this dive site from the rest of Egypt is its hard coral buttress that thrusts out of the water. Dive to the south of the hard coral buttress, descend to a depth of 20 meters, and you’ll find gorgonians and their shelter which extends northward. Hurghada has many faces; it’s home to a classic shipwreck that divers love to explore, has some of the finest reef dives in the area, and is the gateway to other fine diving destinations in the Southern Red Sea. The diving topography, marine life, and wrecks found in Hurghada are highly diverse – making it a top destination for beginner and experienced technical divers alike. The local coral reefs, especially those within the protected marine park of Giftun Island, are nothing short of impressive. Many of the diving hotspots around Hurghada can be reached by boat within 40 minutes – making it easy to find full-day and half-day diving trips. For many divers, Hurghada is the departure point on the way to the finest sites to the south. Here, you’ll see spotted stingrays, puffer fishes, moray eels, and other sea creatures swimming through a pinnacle landscape and feeding off the nutritious sea water. For a relaxing dive, you can take a drift dive along the eastern wall. A banana-shaped reef that’s sitting at the center of the Giftun Strait, the water current in this diving destination is easy – making it attractive for new scuba divers who want to drift along the coral walls. Recognized as one of the longest and straightest reefs in Hurghada, El Fanadir is a nice place to dive and explore regardless of your skill level. For newcomers, you can take a relaxed and calm drift dive along the west side’s main reef. Experienced divers might find the diving and exploring the sandy plateau on the eastern side more attractive. It’s deeper than many dive sites in the area – going down to 50 meters – and hosts larger and relatively rarer sea life. Home to numerous coral forests, teeming with colorful fish species, and occasionally visited by barracudas, hammerhead sharks, and tunas, Careless Reef is one of the more popular dive sites in Hurghada. It also hosts a large population of moray and giant eels thanks to dive guides who regularly feed them. This is a superb dive site especially if you are on a liveaboard. You can easily drop in at the far end of the reef, away from the day boats. The shallow reef showcases numerous coral outcrops (aside from the main reef) that even new divers can easily explore, and thanks to the shallow depth, there’s plenty of light in the area – allowing divers to further appreciate and take pictures of the abundant underwater life. Once severely damaged by an outburst of Crown of Thorns starfish, Sha’ab Ruhr Umm Gamar is now again a favorite site of advanced divers. While relatively small, it accommodates a dense population of reef life and pelagics. Located in the Giftun National Park, this spectacular dive site is a favorite among technical divers. The canyons, sheer walls, caves, along with its plethora of sea life (including whale sharks, barracudas, white-tip sharks, etc) make for a thrilling playground for seasoned diving vets. Regardless of your skill level, El Gouna has something great to offer all divers. The heated pools and calm coral reefs make for an excellent spot for new scuba divers to gain some experience. Technical and savvy divers, on the other hand, can explore El Gouna’s shipwrecks, walls, and reefs – all of which are among the best the Red Sea offers. Thanks to the mooring buoy project and the system that the resorts and dive centres have in place to prevent overcrowding, El Gouna is now home to numerous dive sites. If exploring wrecks gets you excited, the Ship Graveyard Of Abu Nuhas offers four interesting wrecks – the Carnatic (a British cargo and mail ship), the Giannis D (a Greek and Japan-made cargo ship which sank in 1983), the Kimon M (German cargo ship – sunk in 1978), and lastly, the Chrisoula K (a Greek freighter which sank in 1981). All of which are rich in marine life. Located in Sha’ab El Erg, almost anything can happen at this site, including getting up close with a dozen or so dolphins. Another historical wreck that now serves as a shelter to numerous species of fish. Teeming with pelagics and showcasing a plunging drop-off, it offers a unique experience to divers. Located in a wide large bay and home to a long, sandy beach, many divers claim that Safaga’s offshore reefs make for a better diving experience than Hurghada and Sharm El Sheikh. Once a commercial harbour, Safaga became a diver’s favorite over time – one that provides exceptional dive sites, whether you’re a newcomer to diving or a seasoned pro. Showcasing a plateau at both its northern and southern tips, this 300-meter long and slender reef is famous for hammerhead sightings and frequented by manta rays during winter. This is easily one of the largest reefs in Safaga. The numerous grottos, overhangs, and the deep, nutrient-rich water found in the Panorama Reef serve as shelter for thriving gorgonians and soft corals. Thanks its size, this reef has at least three dives to offer – one in the south plateau and one for each of the east and west drop-offs. Despite its shallow and not-so-perfect water visibility at times, the Tobia Arbaa is still regarded as one of the finest dive sites in Safaga. Underwater, gorgonians, octopus, lionfish, and other exotic marine life can be found. The shallow waters are also ideal for snorkelers. This diving destination is a relatively new find. If it wasn’t for the opening of the new airport, Marsa Alam wouldn’t have the support and patronage of scuba divers and foreign visitors. But this is good news for tourists and divers who visit Marsa Alam – the dive sites are not as crowded as other sites in the country and the waters are far more pristine than those in the northern Red Sea. Marsa Alam is home to the legendary Elphinstone Reef. Known as the mythic dive site of the south, the reef’s walls go all the way down into deep, blue waters – adorned with corals of different sizes and colors, sponges, and gorgonians. The reef is the perfect feeding spot for numerous underwater species like dolphins, fusiliers, wrasse, groupers, and more. If you plan to visit Marsa Alam to enjoy its immaculate waters, keep in mind that it is more remote and there are not many resorts to choose from. It’s highly recommended that you go full board as Marsa Alam offers little in the way of dining out. This crescent-shaped, offshore reef is also called Dolphin House. Located about 5 kilometers to the southeast of Marsa Alam, Samadai’s sheltered waters make for an excellent resting habitat for the shy Spinner Dolphins. Reaching Elphinstone Reef is a challenge even for experienced divers. Once there however, divers are treated to the sight of pelagics, barracudas, coral-covered walls, and more. Despite the challenge posed by its strong currents, divers consider it as the Red Sea dream dive. Unlike other dive sites along the Red Sea Riviera, El Quseir doesn’t have coral heads or gardens. Instead, its northern and southern shores are decorated with a nearly continuous fringing reef, which provides for a relaxing shore dive. The fringing reef, combined with the nourishing waters, makes it a suitable habitat for fauna, corals, and deep-sea creatures. Moreover, this destination is also well-known as a nesting area for sea turtles. A coral wall that runs 30 meters deep, it’s not uncommon to encounter white-tip reef sharks hiding in the site’s overhangs. Located just north of the town, this beautiful drop-off showcases a rich and colorful wall of gorgonians. Situated on the southern region of the town, this coral wall is nothing short of pristine and pretty with its waters teeming with marine life. The reefs and scenery offered by Taba may not be as dramatic or awe-inspiring as those found in Sharm el Sheikh or Marsa Alam, but the rare marine life it hosts and its peaceful, less-crowded environment make Taba a ‘must visit’ destination for scuba divers. Pygmy pipe-horses, mimic octopuses, rare species of frogfish – you would be hard-pressed finding these rare underwater creatures anywhere else in the Red Sea. 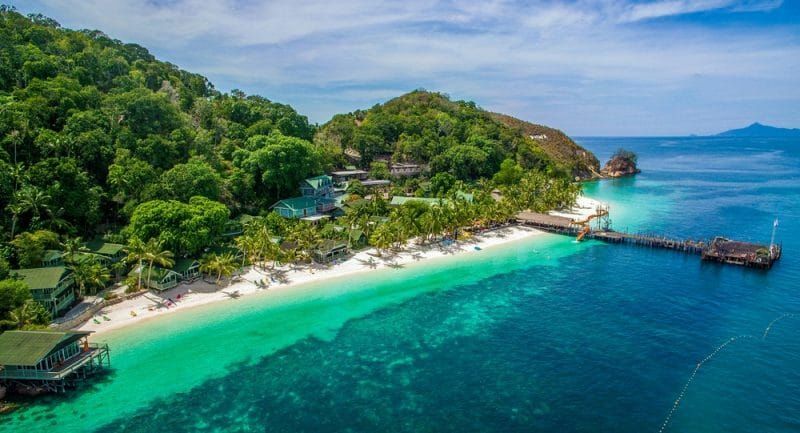 Also known as Coral Island, this destination boasts 4 dive sites, a turquoise lagoon, and plenty of marine life on the reef – making it an ideal destination for divers and non-divers alike. This long and narrow inlet has cliffs (created by glacial erosion) and is a very rare coastal attraction in the Red Sea. Its drop-off provides an interesting dive for advanced divers. Clubs, bars, and shopping malls are nowhere to be found in Hamata, which means you get to enjoy this isolated and paradise-like destination in total peace. Since 1995, NGOs, local authorities, and international organizations like the USAID have worked hand-in-hand to conserve Hamata’s underwater treasures. The regular upgrades, constant monitoring, and presence of mooring buoys have kept Hamata’s dive sites in excellent condition. Justifiably recognized as the 2nd Dolphin House of the South, this massive and crescent-shaped reef serves as shelter to numerous Spinner Dolphins. This dive site is reserved only for experienced divers, and for good reason. This big tower descends to seemingly bottomless depths where pelagics and the biggest diversiry of shark species in the red Sea can be found. With a maze of coral canyons, overhangs, and crevices, Sha’ab Claude is a playground for both beginners and savvy scuba divers. It’s hard not to like Nuweiba. To start, all of the dive sites are easily accessible from the shore. Nuweiba is as serene and relaxing as a holiday destinations can get – allowing visitors and divers to enjoy the Red Sea and its soothing environment away from the crowds. The view underwater is just as impressive and relaxing with gardens of soft and hard corals, crystal clear waters and a ‘treasure trove’ of beautiful underwater life. Located to the north of Nuweiba, this drop-off is suitable for intermediate scuba divers and snorkelers. Its rich coral life makes it one of the top destinations in town. Along with Ras Mamlah, this protected area located to the south of Nuweiba is home to some barely-dived sites. This remote and natural reserve (accessible only by camels and jeeps) features a calm beach, pristine waters, and an amazing variety of sea life. Situated on the northernmost region of Safaga’s large bay is Soma Bay – a diving destination that offers amazing sights in all directions. Looking to the south-west, you’ll see a large, sandy, and shallow beach that’s perfect for swimming and snorkeling. Turning to the east and north-east, you will find the finest fringing reefs of the region. A huge, mushroom-shaped reef that rises out of the deep to about half a meter above the surface, the Middle Reef is home to swarms of doctor fish, giant morays, and blue-spotted sting rays. The calm waters make it ideal for divers and snorkelers alike. This peninsula enclosed by a fringing reef is another top dive site in Soma Bay. The reef gently slants to a plateau at about 25 metres ]and drops off with overhangs, caves, and other underwater landscapes – all of which are inhabited by giant moray eels, reef fish, hard corals, and more. A paradise teeming with thousands of marine life species, Makadi Bay is frequented by divers of all skill levels. With its line-up of drift, deep, shallow, and wreck dives, the dive sites of Makadi Bay are suitable for both experts and novices; keep in mind, however, that the soothing breezes from the north during winter and summer can turn into strong winds when they pass through Makadi Bay – making certain dive sites inaccessible. This network of coral gardens is an excellent starting point for new divers looking to gain some experience. For underwater photographers, this dive site (which is also known as “The Aquarium”) is a dream location with its vibrant and abundant fish and coral life. Puffer fishes, crabs, sea horses, and nudibranches are frequent visitors of Abu Hashish. The shallower yet beautiful regions of Abu Hashish, on the other hand, make for an easy and relaxing dive for snorkelers. This is an excellent location for intermediate divers to explore. This great fringing reef has an impressive drop off where great turtles, moray eels, and underwater hunters like white-tip reef sharks and barracudas are usually seen.